A cohort study by a team of medical professionals, led by Hillary C. Frankel from Brigham and Women’s Hospital and Harvard Medical School in Boston, recently discovered that vigorous physical activity may decrease the risk of developing psoriasis. Moreover, the study conducted among female nurse respondents also revealed that an increased amount of physical activity also has beneficial effects on other inflammatory disorders, type 2 diabetes, colon cancer, and even coronary heart disease. According to researchers, it’s possible that physical activity targets systemic inflammatory mediators to reduce one’s psoriasis risk. Psoriasis is a chronic skin condition characterized by scaly-looking and inflamed areas on the skin, which is caused by a faulty immune system that promotes inflammation and overproduction of skin cells. If you want to know your risk of contracting psoriasis, or if you’re already exhibiting signs of the condition, set an appointment with a trusted dermatologist in Provo, Utah. Doctors from leading dermatology offices, such as Stone Dermatology, can effectively diagnose your skin problem and provide the necessary treatment. Psoriasis usually affects adults, but individuals with a family history of the disease are particularly susceptible. Other known factors that worsen skin inflammation and scaling include weather changes that dries the skin, stress, and use of certain medications. Results of the study made researchers conclude that positive health behaviors and participation in vigorous exercise can be considered as new preventive measures for women who are at high risk of developing psoriasis. In the longitudinal study, data were collected from 86,665 female registered nurses in 15 states all over the U.S., who were aged 25 to 42 years old in 1989. After years of analyzing detailed questionnaires and interpreting statistical data, the researchers found that the most active women had a much lower age-adjusted risk for psoriasis compared with the least active women. 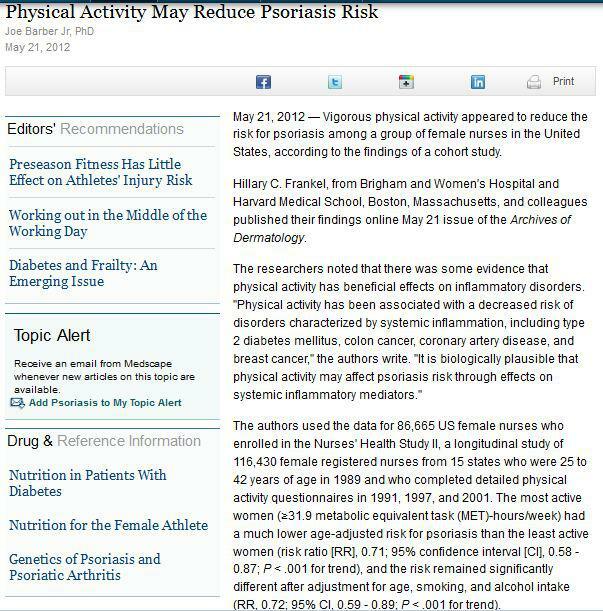 However, note that authors excluded women who were diagnosed with having psoriasis before 1991, and the physical activity referred to needs to be “vigorous”, which makes simple walking or light exercises irrelevant to the findings. Although a skilled Provo dermatologist can screen you for signs of psoriasis, you need to be aware of some of the symptoms yourself, such as the red, flaky, and crusty patches on your skin that are covered with silvery scales. While psoriasis can affect almost any skin surface on your body, it is commonly found on the knees, scalp, elbows, and lower back. One other good news from the the study is that exercise may, in fact, trump your genetic predisposition towards psoriasis. Hence, regardless of your genetic makeup, you can start protecting yourself against psoriasis by maintaining an active lifestyle and visiting your dermatologist regularly for checkups.